We don’t allow dogs outdoors randomly roaming neighborhoods; we should – whenever possible – keep cats indoors only (and simultaneously enrich their indoor environments). I realize some cats have been outdoors their entire lives. We find them – and being friendly and insistent, they adopt us. We take them in because we have big hearts. Some of these individuals appear grateful to now be kept inside only (unfortunately not all cat owners encourage this), but many of these cats demand in no uncertain terms to be allowed outdoors daily. I get that – but also know that with an enriched indoor environment, and people being as persistent as their cats, gradually these cats can be kept indoors for more and more time, until they transition to living inside only. Most indoor-outdoor cats were at some point also encouraged to go outside by their well-meaning, though I believe misguided pet parents. Why is being indoors only so important, particularly if cats are indeed spay/neutered so they can’t reproduce? 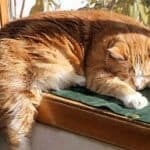 There are a myriad of available calculations regarding the lifespan of indoor only cats vs. cats that are indoors and outdoors. According to cat researcher Bryan Kordis author of the “TNR Handbook,” the average life of cats spending time outdoors is reduced by about four years. That’s certainly significant if it is your cat. Anti-Freeze: Just a tablespoon’s worth can kill a cat. Car hoods: In cold weather cats will slink under car hoods to warm up, like it’s an electric blanket. But when unknowing drivers turn their motors on, cats can be mangled or worse. Cars: It’s a fallacy to believe that cats are so cunning that they do not get hit by cars. It happens to someone’s cat every day. Cat fights: Cats will sometimes battle with other cats over territory, or other reasons. Coyotes and other wildlife: In some areas, the coyote population has increased. They will prey on cats. Birds of prey can sometimes swoop down and kill cats. Cytauxzoonosis: This a tick disease, which is nearly always fatal. Veterinary parasitologists agree that tick disease, not currently identified, likely affect our cats too. Tick protection helps, but too many owners don’t even provide it. Fleas: Left unprotected with a suitable (veterinary) product, fleas can be a nuisance or worse, even transmitting cat scratch fever and/or tapeworms. Heartworm: While all cat owners should protect cats from heartworm, most do not. Indoor only cats are susceptible since mosquitoes (that transmit the disease) often get indoors, but obviously outside cats are even more exposed and when left unprotected; heartworm may be deadly, or often impacts quality of life. Human Cruelty: People actually shoot outdoor cats, or abuse them. Some people set inhumane traps and some outdoor cats are poisoned. Infectious disease: Unprotected, cats are potentially prone to feline leukemia and the feline immunodeficiency virus. Stray dogs: Sometimes stray dogs will chase cats and they will injure or even kill cats. Weather: Extreme weather conditions can make it nearly impossible to hunt (outdoor only cats can starve). Even indoor-outdoor cats can suffer heat stroke (though they are generally adept at finding shade), and may also suffer frostbite. Allowing cats to use neighbor lawns as their litter boxes is just plain rude, and a thoughtless neighbor. Also, cats may use neighbor cars as a playground, scratching the car in the process. More commonly, just being in front of a neighbor’s home (perhaps more likely to appear knowing there are cats indoors in that home), those indoor cats may begin to spray in response. Inappropriate elimination is the most common explanation for relinquishing cats. There are people who give up on their indoor cats, all because of outdoor cats – it happens all the time. I am not ignoring the wildlife issue. Cats do eat wildlife, though managed trap-neutered-returned colony cat hunt far less, and sometimes they don’t hunt at all. What cats eat is whatever is easiest for them to catch, based on what’s abundant where they happen to be geographically – and mostly the answer are rodents (of one kind or another). This is an accepted fact. In big cities, the answer for lots of cats – as their most common food source – may be trash in alleys combined with handouts, as well as city rats. In one study, for example, lizards topped the preference list. Cats do certainly eat birds, but those numbers are often exaggerated. No matter how well fed cats are, cat owners know some individuals still hunt. They are, after all, still cats (with a hard-wired prey drive). So, here are some facts, rather than conjecture: Either well feed indoor-outdoor cats, or outdoor colony cats supplemented with plenty of food may or may not hunt. Studies demonstrate many cats given meals don’t hunt. Others (that are indoor/outdoor cats) are overweight or obese, and not capable of hunting effectively. Some indoor/outdoor cats and some outdoor only well fed cats, do capture prey – sometimes traumatizing the bird or mouse, but not eating it (that traumatized animal may still die). However, if a cat is indoors only or if more cats are TNR’d and feline populations decline outside, less wildlife is killed. Still, think of the ethics of allowing your cats to unknowingly impact the behavior of neighbors’ indoor cats, to poo in their gardens or to snack of wildlife (sometimes songbirds that should be protected).